This issue we're featuring Adam Clutterbuck whose black and white work, whilst exhibiting a familiar surface sytle, manages to create something quite fresh - a difficult goal in any genre. Take it away Adam.. In most photographers lives there are 'epiphanic' moments where things become clear, or new directions are formed. What were your two main moments and how did they change your photography? I recall having many minor 'epiphanic' moments during the early days of my photographic learning curve. Coming late into the photographic medium from the side, not having a formal training and making up my own path without much perspective into what has been done to death rather than what is fresh, I found excitement in every photo that remotely 'worked'! Over the years I have calmed down as I see similar stuff from other photographers recently bitten by the bug, so I try to follow my own path and be inspired by what I see around me and the possibilities they offer. I almost miss that naive, childlike excitement about everything that I was doing, but it does return from time to time when conditions and locations permit! I will attempt to pick out two episodes that were real turning points in my photographic style and contributed greatly to who/what I am today. On one occasion, after pondering where I was with what I had done, I spent some time going back over what I had shot over the previous couple of years. I found myself looking within the photos - searching out the stronger composition within what I had actually taken. These stronger compositions were always squares, and I was also converting these to black and white, as this was more satisfying to my mind. These cropped compositions were the fore-runners to my photographic style and direction to this day, except since that time I try to compose my photographs 'before the fact', in camera, and predominantly with a final square in mind. I can pull out another moment when I realised what photography had done for me. I was experimenting with ND filters at my favourite Cornish beach, one that I had visited man and boy, but never with a camera with the aim of capturing its beauty. That evening the light was stunning, soft evening light that wasn't harsh, the sort of light that made the greens of the seaweed covered rocks pop like I had never seen before. I realised that I had probably never appreciated this in such a profound way as I did then as I started making photographs. The photographs that came from this session are still relatively naive, but they do have that rare quality of light that I always enjoy when I see them. Tell me about why you love landscape photography? A little background on what your first passions were, what you studied and what job you ended up doing. As a boy growing up in Cornwall, I probably took the opportunities to be with the sea for granted. We lived in a town that wasn't by the sea, but was within half an hour's drive of most of the coast of West Cornwall, and looking back now I got plenty of exposure to the variety of landscape on offer, but I'm sure I didn't appreciate it at the time! I was a good swimmer and enjoyed snorkelling and took up scuba diving for a while, but strangely I never learned to surf. Academically, I did well enough generally but was strongest at mathematics and science. Always at a loss for what I wanted to be when I grew up, I pushed on with my strengths through school, college and University, finding my way into a career in computational aerodynamics - maths and physics basically. My first job as a research scientist found me surrounded by professors and doctors, who knew what they were talking about. I found myself overawed and waiting for someone to ask me to demonstrate my knowledge, knowing I wouldn't measure up. After a few years of tinkering around the sides of other people's work, I left that job and found a job working with computers, more aimed at supporting the 'clever people' rather than being (or not being) one. 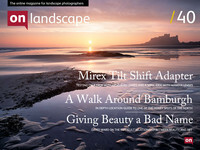 Landscape photography is a perfect antidote to the stresses of a technical career. Although it has technical aspects that must be learned or guessed at, the driving force behind my photography is to find the beauty in the location, hindered or helped by the conditions. So it is a creative process to place the tripod, to align the elements of the photograph such that the desired final (usually square) composition is pleasing to the eye. On composition, I find I don’t consciously place lines, balances, points, textures according to rules I could write down. It happens subconsciously and just ‘feels right’. Interestingly, my father who is a sculptor, tells me about my compositions – pointing out what he sees in terms of balance and structure – often invisible to me. I find that going out with a definite purpose after some research and with some luck coming back with a good result immensely rewarding. I feel like a collector, when I come back with a photograph that belongs in the collection, it is with a certain satisfaction, as if I'd found it in some unlikely shop at a bargain price, but after some hard yards securing it safely. There are many suggested links between maths, music and art - mostly around pattern recognition, simplicity, etc. Do you see anything like this in your work? I certainly appreciate strong geometry and symmetry in my photography, and often explore symmetry and repetition. Whether this is something to do with my background, or jus t the way my eye and brain work I don't know. You took an Open College of Arts course, can you tell me a bit more about that? Hmm, I signed up for that course pretty much at the same time as I upgraded from a digital point and shoot camera to my first DSLR back in 2003. The course was pretty comprehensive as far as I knew at the time and I made a start with some of the exercises and sent in two or three of the assignments. I don’t know if it was the structured nature of the course, or the rather uninspiring feedback from the course tutor, but I must admit to losing interest pretty quickly. Not one of my best purchases – probably all my own fault! I decided to teach myself at that point – after all there isn’t a resource to beat personal curiosity coupled with the internet for research. I usually take all my cameras and lenses when I go out, so it is fortunate I don't have a huge collection. I don't often pre-visualise a composition ahead of visiting a location, preferring to see what might work when I explore, so I never know which camera/lens I am going to need before setting out. My main combination usually ends up being my Canon EOS 5D MkII with the Canon 17-40L as I often work with quite wide perspectives of my subjects. If I want a more straightforward view, perhaps some detail or documentary shot, I will swap to a Sigma EX50mm lens. Another interesting object is a simple lensbaby - this looks ridiculous on the big digital body, but provides me with another creative option. The tripod isn't really required when working with a lensbaby, so actually it is an opportunity to shoot hand-held with a less cumbersome and more instinctive compositional approach. I also enjoy working with two film cameras - a simple holga and a pinhole, both of which take medium format film. Certain subjects lend themselves to using these cameras, and I love the imprecise and flawed photographs they create. I try to get most of the photograph done in camera, using grad filters to balance sky and ground where I can, but sometimes combine bracketed photographs when I have been lazy. As far as post-processing beyond that, I work with the RAW file in lightroom - switching to black and white if required, using recovery, adjusting curves and contrast etc before exporting to 16bit tiff file. Repair work (dust spots, hot pixels and the like), cropping and sharpening I then do in Photoshop before saving a master hi-res tiff and jpg and then preparing jpg's for the web. You've sold quite a few prints in a local gallery I believe, did this experience teach you anything about what sells and did you change your photography from that feedback? I was very lucky to be offered a wall in a new gallery startup in Clevedon quite early on in my development, and was surprised and delighted when they sold well. I was quite bold in printing large prints and framing them up generously into quite substantial items and they were obviously quite attractive to the customers. Looking back, this experience gave me greater confidence and stimulated me to go out much more with the distinct aim of making photographs for the wall, thinking more carefully about composition and what might sell well. This became a balancing act as I had to find the line between my personal vision and the public appetite, being careful not to let my direction be swayed too much in the process. Over-confidence led me to over-stretch the number of framed pieces I had in the gallery, and sadly when it closed a couple of years after it opened, I got rather a shock at the sheer number I suddenly had to collect and store at home. I am still represented by another gallery in Clevedon, but with a very much smaller collection of pictures - all of the famous pier, which sell regularly. These photographs are very much ‘of the place’ and therefore stand a fair chance of appealing to locals and visitors alike. The challenge of creating a compelling photograph that transcends place, such that it doesn’t matter where it is being sold is one that intrigues and drives me to this day. When I first discovered the large format work of David Fokos, I was astounded and captivated by what long exposures could do to simplify his compositions. I soon discovered Michael Kenna and it seemed to me that while Fokos and Kenna shared a particular aesthetic, there seemed to be more atmosphere in Kenna’s works, Fokos’ work being perhaps a little more clinical. The difference seemed to be in the skies, Kenna seeming to favour cloudy conditions, and as a result there would be another dimension to his work. Personally, I prefer cloudy conditions for my photography and I love the changing light that is on offer. Starting to share my work, I discovered some of my photographic peers (peers only in that we were displaying in the same places, I’m not saying they were my equals). Flickr photographers such as Xavi Fuentes (m_ i_ n _o_ r) and Brian Chapman were doing minimal black and whites that pulled me further in that direction. Flickr and sites like it would become an almost limitless resource of ideas and inspiration – perhaps too much, a dazzling array of colours, textures, locations, techniques, equipment, film stock, processing etc. I often wonder how different it was before the internet – is it important to immerse yourself in as much photography as possible, or can one define one’s own style in more isolation? Some ideas and photographers floated to the top and caught my attention. I discovered the quality of film through photographers like Zeb Andrews and Craig Abell-Champion (Truckstop) who were experimenting with pinhole and toy cameras. The photos they were showing weren’t perfect. Using non-precision instruments and film can lead to imperfections that can add to a photo – film bend, light leaks, dust, distortion, dark room issues – none of these mean the end of a photo, quite the opposite in many examples. There seems to be more soul in some of these film photographs and that is something that I’d like to see in my photos, that unpredictable factor. Lastly, I’d like to pick on Rob Hudson, Rob has a very subtle way of making you question what you are doing – why are you doing it? Rob’s work is inspiring, he has left behind the conventional landscape photograph and is working from the heart these days. His recent series Tree Line and Skirrid Hill demonstrate this freedom, I recommend you check them out. I have already referred to the Cornish beach and the perfect light, one of the photographs I took that evening is one of my favourites to this day – even though it was 8 years ago. The undulations of the granite bedrock in blues, greens, golds and silvers surprises me every time I look at it. I remember that the colours really were that saturated on the night. The particular spot I was standing on is no longer accessible as a huge rock to my right has since split in two and fallen across this spot, so I’ll never better this particular view! Dungeness Boat has a presence that I can’t quite explain. It was taken in relatively ordinary light one summer evening but the low viewpoint with the wide focal length (10mm) gives it a subtle looming stance without much distortion of the surroundings. I am pleased with the digital black and white conversion, and love the textures of the old boards and the items and flowers strewn around the foreground and background. I got this photograph into the Royal West of England for one of its open shows, and am still very proud of that achievement. The third photo is actually a pair, these two pinhole images were taken in St Ives harbour – a place we visit frequently as a family, and I have been returning to St Ives for more than 40 years now. I vividly remember the harbour beach as a five year old and am forever emotionally attached to the place. The shots are wonderfully empty, with the ropes and pier the only real elements, and the atmosphere the pinhole imparts is perfect I think. I fancy that I see the letters S and C in the two photos, so I am framing them up for my father Stephen Clutterbuck who celebrates his 80th birthday this year. One of the photos has a horizontal line across the sky which I can’t explain, but I don’t think it detracts at all. Perhaps I could do a week’s intensive sailing course, if you’re paying? I think I will be trying to do more photography as projects, concentrating on places and visiting multiple times, to build up more of a rounded expression of a place in a body of work rather than a single photograph. I will also be doing my own film processing soon, so I am sure that those film imperfections will increase rather than decrease! I think Zebediah Andrews might make a wonderful interview. He always has interesting things to say on his photography. Thanks to Adam Clutterbuck for some excellent and informative answers - you can see more of his work at his website or his flickr stream. In the meantime, here are some more of his excellent pictures.